3. 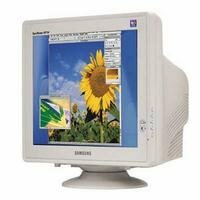 Samsung SyncMaster 1100DF 21"
15. Samsung SyncMaster C997DF 19"
Whether you're a regular PC gamer or just like listening to Internet radio while you're working on your latest spreadsheets, the HP Pavilion F1703 fits the bill. Including two external five-watt Harman Kardon speakers and a 17-inch TFT active-matrix LCD panel, the F1703 saves space while providing an exceptionally clear visual experience. With an optimum resolution of 1,280 x 1,024, images are clean and crisp; a 0.264 mm dot pitch and 350:1 contrast ratio provide clear color separation and sharply defined tones, whether you're editing digital photos or simply shopping online. Analog source inputs supply smoothly reliable data transfer, while the anti-glare, anti-static coating insures a clear view under any lighting conditions. Simple onscreen controls allow easy image customization, and the Kensington lock slot for an optional cable supplies additional security. The one-year warranty covers parts, labor, speakers, and the backlight. 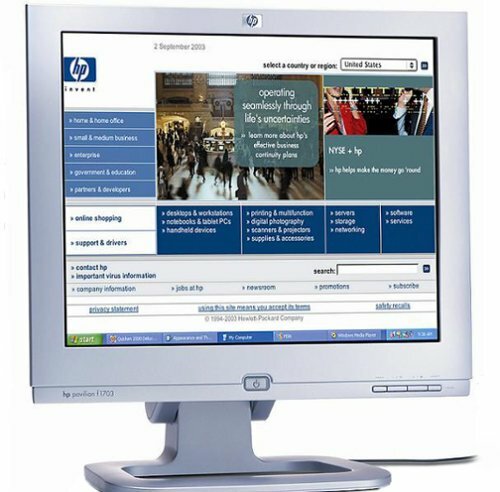 I purchased this monitor with a HP desktop on the 3rd of May 2004. 13 months and 1 day later, on the 4th of June 2005, the monitor screen would go black, but the power button would remain lit. To get it to work again, you would have to turn it off and turn it back on. However, this problem re-occurs again around 10 seconds later, rendering the monitor useless. Designed obsolescene. Isn't it fantastic? Great. I've had this monitor for just about a year and suddenly thescreen goes black for no reason.Press the button and the screen will work for another 8 seconds, then go black suddenly. Press it off, press it on, it'll work for 8 seconds. Apparently from forums i have read, a vast majority of other owners have this monitor problem, and unfortunately there's no class action suit to recall the monitor.After a year of any of their products, HP wants nothing to do with you. Right now i'm using my faithful old CRT monitor too, the very thing i tried to replace. Ah well, how utilitarian of me to support big business at the expense of myself. This monitor powers its own speakers, which is nice because it gives you an extra outlet.It comes mounted on a light but sturdy base that can be adjusted down to the level of the desk and up to about six inches.A cd is included, but installing the software was not necessary on any of the three PC's I hooked the monitor up to.It works perfectly if you just plug it in.Images are crisp and vivid, and the adjustable base makes it even easier to tuck this already flat monitor into a corner to save desk space when you are not using it.Very highly recommended.I bought it in a store a long time ago when it cost a lot more money than it does now on Amazon.com, and I still have no regrets. After our 2 Viewsonics died on us (would shut off suddenly and not turn on again), we purchased 2 of these. We've used them now every day for over a year and they're performing as well as on day one. I will buy a 15" version for my mom. The speakers are very convenient, however if you primarily use your computer to listen to music or watch movies, then I'd recommend replacing them with something a little more high end. The KDS XF-7i 17-inch monitor offers a low cost solution to your basic, everyday viewing needs. High 1,280 x 1,024 screen resolution is combined with 0.25 mm dot pitch for clear, crisp onscreen images, while a wide range of standard user controls, including your choice of seven languages, lets you customize screen settings for optimal viewing. The KDS XF-7i offers plug-and-play setup, as well as an adjustable base with tilt and swivel capabilities. It has a multi-layer anti-static, anti-glare screen coating for comfortable extended viewing, and comes with everything you'll need to get started. This model is backed by a three-year warranty. I am not a techie - just an avid internet nut, so I'm not going to have much to say from a technical standpoint. 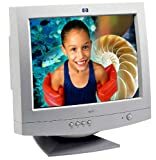 Anyway, my monitor at work started getting dimmer and dimmer causing my eyes to become very tired very quickly.I rushed to get a new monitor and found this great value at Amazon. Within three hours of purchasing this item, Amazon emailed me my tracking number!Now three days later I am enjoying this new (bright!) monitor.It was very easy to set up and adjust. On top of the great price, the free shipping was a nice plus! Thanks Amazon, for another great and value-filled shopping experience! My Gateway monitor finally took a dive, I needed a quick replacement and found this monitor, It is truly a great deal, great picture, and it arrived on my doorstep within 48 hours of placing the order, I chose the Super Saver Shipping option. 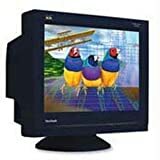 I have been scouring the Internet for the past few days looking for an inexpensive monitor to replace my old 15-inch Trinitron monitor from Gateway until I came across this little gem. 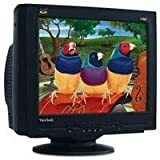 I am very impressed with the picture and quality of this monitor.It is just big enough to use with a screen resolution of 1280x1024 and works fine with both Windows and Linux.This monitor has plenty of geometry and color controls and delivers fantastic contrast for a CRT monitor.I was a bit hesitant to purchase a flat-screen monitor for this price; in some of my shopping I found flat-screen monitors advertised for the same price when they were just a convex (curved) screen behind flat glass casing. For the price, you cannot get a better deal.I used the Super-Saver Shipping option and it was at my doorstep in less than 24 hours from when I placed the order.The KDS XtremeFlat XF-7i 17" CRT Monitor is truly flat and makes any viewing angle comfortable; it is very easy on both the eyes and the wallet. I bought this monitor to use with a second computer in my home.So far, this monitor has exceeded my expectations.The view has been more than adequate for surfing the internet and using general office applications.I wanted to see just how good the picture quality can be.So, I installed a Sony DVD player on the computer so that I can test how the monitor will look playing a movie.I watched The Return of the King on this system and was impressed by the picture quality.Take the fact that the graphics card on this system is geared towards the business user and you will even be more impressed with the monitor. 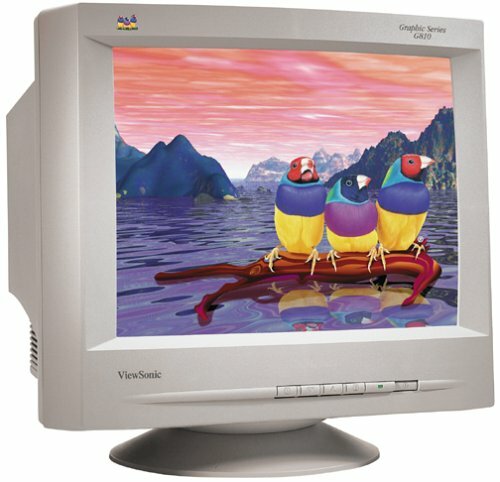 My primary computer system has a 19-inch Trinitron monitor.And honestly, if I am just surfing the internet and sending e-mail, this 17-inch KDS is just as nice to look at.The Trinitron monitor does show more saturated colors when watching DVDs and such, but that could be due to that system's superior graphics card. 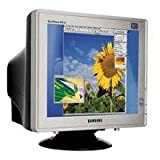 I can find no fault or shortcomings in this 17-inch KDS monitor.I can recommend this unit, with no reservations, to anyone looking for a 17-inch flat screen CRT. 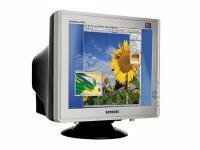 The C793DF from Samsung is a 17-inch (16-inch viewable image size) CRT monitor with a DynaFlat screen and three different brightness settings designed to work with a variety of applications. With its 1,280 x 1,024 maximum resolution and fine 0.20 mm horizontal dot pitch, the C793DF delivers high-quality display images that are accurate and easy to see, while its anti-glare screen treatment helps to reduce reflections and the resulting eyestrain. The monitor supports RGB analog input signals through its 15-pin mini D-sub connection. Its power supply consumes about 80 watts during normal operation. The C793DF has 30 to 70 kHz horizontal and 50 to 160 Hz vertical scanning frequencies and a 110 MHz maximum bandwidth. Weighing 31.5 pounds, the monitor has a 15.8-by-14.9-inch footprint, which fits easily onto most desktops. Compatible with PC, Mac, and Sun Microsystems operating systems, the C793DF comes backed by a three-year warranty on parts, labor, and CRT. I bought this monitor almost a year ago and it is still going strong. I am the computer tech for a non-profit agency that provides a computer lab for the public. 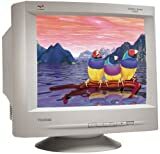 I was so happy with the 793DF that I recommended my company replace their old monitors at work with this same model. We had one bad monitor (out of 9 total) shipped to us but Amazon had a replacement there within a week, no problem! They have been in service for over 6 months now with a great picture on all of them. They are used by the general public daily and go through the normal use/abuse that people put them through. I bought it because the old monitor at work that has been on my desktop is a Samsung and after 6 years is still ticking! This Monitor Is NOT a Good Purchase! 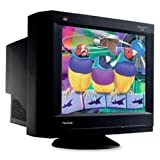 I purchased this monitor in Dec. 2004 from a Amazon, which did it's job well. Delivery was on time. I put the monitor to use and kept my old monitor which was 10 years old in a box. I used this new monitor, but after about a month it seemed that I was able to discern the refreshing of the screen. Then in April of 2005, the screen of the new monitor began to have horizonal lines in brown flashing across the screen, a few, then more, then it overwhelmed my screen. I called the Samsung tech help. I was told to clean all of my pc's cards, clean the RAM, take my pc all apart. I did clean out the inside of the pc with air, but didn't do the other. I then turned the pc on, and within 4 hours the lines began to reappear. Then the entire screen went into a horizonal blurring of lines. I shut it down, quickly. And put my old monitor back in service, to make sure that it wasn't the new monitor. Upon restarting my pc, I noticed that my RAM was missing 64 MB's...a stick had burn up! I had to pull the bad stick of RAM out. And then reboot. I now have less RAM, and I'm using my old monitor now for about 10 days with no PROBLEM! Samsung tech gave me an RMA and I had to put $150 onto my credit card so that they would send me a, what I thought should be a new replacement monitor. Now, sitting on my table is the bad monitor in the box that they sent the replacement monitor in, the GREEN Label in place so that they will accept it back! And on the box was the words: REFURBISHED! They sent me a refurb monitor that has a mfr date of July '04 on it!!!! I'm afraid to even hook it up! I feel that I've been swindled! I am using my old monitor and the replacement unit will become a dust collector. If I hook up the refurb it will probably burn up my pc, my office and my business! To much to risk! I suppose the old addage, if it ain't broke don't fix it should have been adhered to by me. I'm out my purchase price for the monitor, I had to pay the shipping back to Samsung of the bad monitor to the tune of $30! I will have to hope that they don't run off with the credit card $150 as well, but if they do, I would be out more than $350!!! Bad service from Samsung all around. If the monitor is e773c, it is not that bad as the the previous review stated. In fact, if you go to dell.com you will find this monitor is still on sale. I bought this monitor with my dell PC and it works great as it should. You DO NOT need to resize it every time. 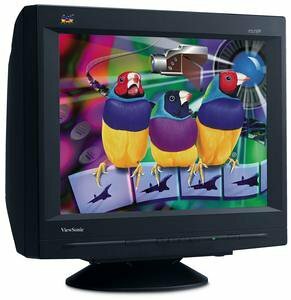 It has richer color than a LCD monitor as all CRT monitors do. Of course, you always get what you paid for. But for the price and performance, I will give it 5 stars. 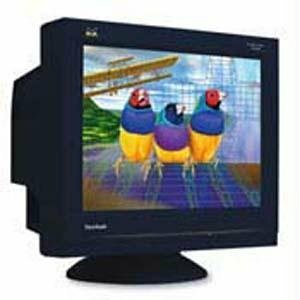 Affordable quality in a 17" (16.0" viewable) CRT. The 17" (16.0" viewable) ViewSonic E70 is the right choice for small and home office users and students who are ready to upgrade their smaller monitor... at an affordable price. With its 0.23mm horizontal (0.27mm diagonal) dot pitch, crisp images and vivid colors this monitor is ideal for a wide range of applications from word processing and light graphics to surfing the Internet. It offers OnView&reg; controls, which allow the user to make easy screen adjustments via an on-screen menu. And the OSD lock function prevents unwanted changes to display settings. For affordable quality in a 17" (16.0 viewable) CRT, choose the E70. Finally, a monitor as cool looking as what you're viewing on the screen. 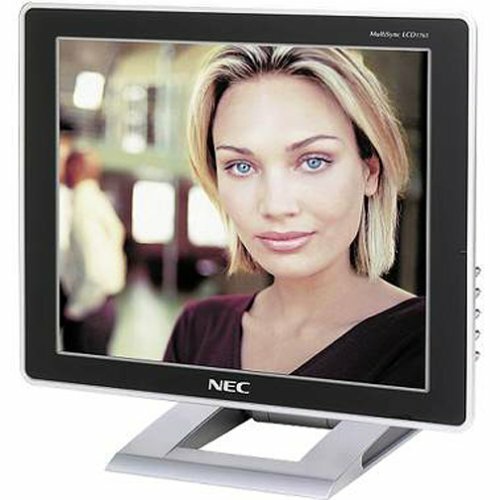 The eView 17f3 monitor features dynamic, new styling and colors that, together with your eMachines computer, turn your desktop into a fashion show. 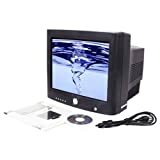 Advanced flat CRT technology gives you a large, distortion-free, non-glare screen that is perfect for graphics, DVDs, and cruising the Internet. In fact, its brilliant .25mm pitch picture quality is matched only by its great value. Plus, it couldn't be easier to use. Plug it in and it's ready to go. On-screen display controls make it simple to optimize colors and resolution. And it's Energy Star&reg; compliant for state-of-the-art efficiency. I now have three of these monitors and I am surprised and happy with it's level of quality. My monitor of choice would probably be NEC if the eMachines EVIEW 17F3 weren't around. A great performer that's attractive at an attractive price. 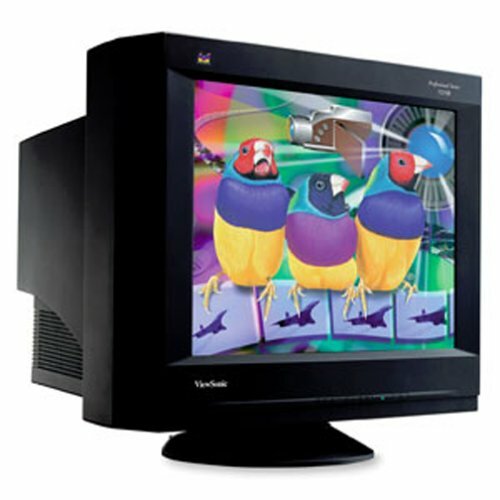 The Xtreme Flat 17" XF-7bk display uses the DynaFlat CRT for graphic designers, gamers, and those who want the advantages of a flat screen monitor. 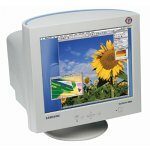 This display features a fine 0.20mm (horizontal) dot pitch and a flat screen, which virtually eliminates most of the distortions found in the corners of conventional CRT monitors. Plus, it features a sleek black cabinet design to enhance the look of your working environment. I haven't actually used the monitor yet. It's a gift, but I have the free super saver shipping with this and I received it overnight!!!!!!!! I purchased this monitor for my father to compliment an old notebook computer with a dying 12 inch screen.Basically, I was looking for an inexpensive but quality monitor. I was highly impressed by the quality of the picture produced by this monitor.It is not only an improvement on the notebook's dying flat panel, but it is a very crisp, refreshing interface. The color reproduction is execellent.The 85 Hz refresh speed is very easy on the eyes (I'm using it at XGA resolution).The visibility from oblique angles is superior to many other monitors I have used.My little sister now uses this monitor to view and edit all the pictures from her digital camera. The monitor "remembers" its internal settings for specific video modes.This is very useful if you might use it at different resolutions - when the computer attached starts the monitor in a video mode for which the user previously made adjustments to the monitor, the monitor remembers those adjustments and applies them.Thus, you can change resolutions without having to change the monitor internal settings every time. It seems if the "width" of the usable pixels area is stretched too much that more of the "stretching" is applied near the borders (right and left edges, less than 3/4 inch) than in the center.This can cause an appearance of on screen text being spaced more widely toward the edges of the monitor.I consider this problem minor, because the image is still clear and crisp in these areas. As another reviewer mentioned, there was no floppy diskette with drivers in the box.This was not a major problem.Many generic drivers in any version of Windows can control this monitor.However the KDS driver is available for download on the KDS website and it is relatively simple to find it there. Now this is not a "professional" monitor, but I am highly impressed with the quality I received for this price.If you are seeking a budget monitor, I can recommend this KDS monitor strongly. 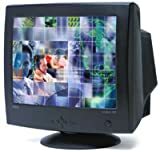 For the price that the KDS XF-7BK Xtreme Flat 17" CRT Monitor is at it's a great buy. My monitor shipped in only 2 days using Super Shipper. The manual was a bit too thin for my tastes but setting a monitor up is easy without it. You'll have to go to KDS's site to get drivers and Color Management if you're really into video quality. 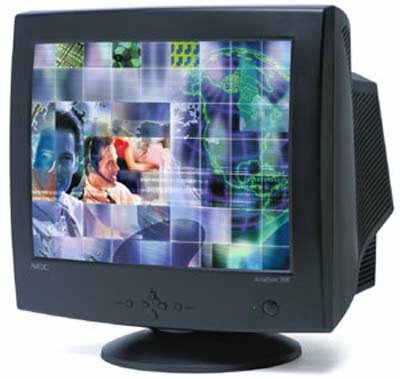 The controls are simple and the onscreen display is similar to nearly every other CRT monitor. The image is clear and crisp at 32 bit color and 1024 x 768 resoltion. The monitor supports up to 1280 x 1024 but I never run it any higher on my desktop than 1152 x 864. If you want to run it at 1152 x 864, turn up the refresh rate to 70 Hz. Your eyes will thank you and you'll like the extra desktop space. I do run some slower turn based and strategy games at 1280 x 1024 without any problems. For the money, you can't go wrong! I bought this monitor for the price, and I am very impressed with the picture quality. This monitor is a huge improvement compared to my old monitor. The picture is bright and crisp.Also to let you know, this is a plug-n-go monitor.It does not require any drivers if you are an XP user. This monitor, like the KDS monitor I bought 3 years prior, becomes too bright after approximately one year. Adjusting the brightness does not help. My NEC monitor which I have had for more than 6 years has lasted longer than two of these KDS monitors. If you can afford it, buy a better monitor.